Music Thing: War Machine! 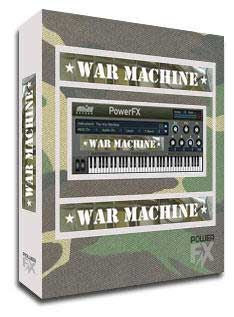 The VST plugin for... WAR! War Machine! The VST plugin for... WAR! "Whats this plugin good for?" herr prof for the win. "well on my mixtape there are tanks and flame throwers"
Okay, foolish question: is it touch sensitive? (I know, I know, why would it be, right?) Or affected by the mod or pitch wheels? Or is it basically just a massively overpriced set of 87 sounds? The thought of anyone in the world being interested in this product concerns me. In more ways than one. Err... well my first thought was that it's for people who need sound effects for video-games or movies or something. But why a plug-in? (not for copy protection because the sounds are in separate wav files anyway) And only 87 sounds? "USELESS AND USERLESS" - unless you need to make an audio sequence for a museum installation, for example. Or maybe you need some folio for a broadcast or film... "Or is it basically just a massively overpriced set of 87 sounds?" - well, if you consider that a decent quality rocket launcher effect from sound effects library.com costs between GBP 4.00 and GBP 6.5 - what's that, eight to 13 USD for one effect? But the real question should be, are they original 24bit recordings or are they just transferred from tape or some other medium? This plugin is not for musicians, its for sound designers to use for movies, animations, etc. I work for a Anime production company and we use this stuff all day long. The reason you would want it in a plugin is because its very easy to switch sounds or banks without having to open the Pro Tools project browser and clicking on a single file to audition and then import. With the sounds mapped out across the keyboard you can also "play" them as you are watching your video, instead of having to line them up and sync via dragging. Pretty cool plug, just wish it had more sounds. Kind of a neat idea, if you're doing effects work or something. What I'd really like, is a VST version of the Laff Box. DIY sit-com heaven. I immediately thought of British Grime and dubstep (skream's Midnight Request line). Gun shots are always in that ish. Also, hip hop producers use gun shots to cover up naughty language in "clean edits" (Mob Deep). @ Anon #7: If that company is ADV, then I would be looking for a "better voice acting" VST instead of this.